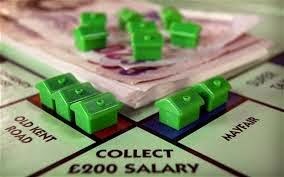 British house prices rose at the slowest pace in August, according to a survey on Thursday that suggested speculation about higher interest rates has dampened buyer confidence. The Royal Institution of Chartered Surveyors' monthly house price balance fell to +40 last month, its lowest level since last August, and falling short of forecasts for +47 in a Reuters poll of economists. July was revised down slightly to +48. Agreed sales fell for the first time since September 2012 and there was a second consecutive fall in buyer inquiries. "Some of the momentum has come out of the housing market of late reflecting in part concerns over a likely rise in teh cost of borrowing at some point in the not too distant future," said Simon Rubinsohn, chief economist at RICS. Bank of England governor Mark Carney said on Tuesday that the bank may start to raise interest rates next spring if the labour market continued to recover from the financial crisis. The RICS survey of chartered surveyors added to evidence that London's housing market is cooling off after fervent price growth earlier this year. The London house price balance eased to +9 in August from +11. Mr Rubinsohn said: "There are signs that the Londonmarket is gradually moving on to a more sustainable footing with a modest increase in the number of instructions coming through slowly helping to create a better balance with demand, and in the process, taking the edge off price gains." Britain's biggest house-builder Barratt Developments on Wednesday predicted a return to "more normal" trends in Britain's housing market. Yet another sign of easing in the British property market but then again, one has to take such survey with a slight pinch of salt as depending on who does it and how it is done, the results can most always be subjected to interpretations. However, the fact remains that the amount of new housing stock is currently rising at a much faster pace compared to say, 2 years ago. This is especially within the prime areas around London. Market analysts have estimated that 48% of the nearly 23,000 new homes priced at more than GBP1,000psf are located in the six key clusters along the River Thames. And some 13,000 units could enter the rental market over the next few years. No Comment to " UK home prices: More signs of market easing... "